“Thank You!” Volunteers for a Wonderful Year in 2017! A HUGE THANK YOU and special shoutout to all of our volunteers over the last year! YOU make what we do possible and here’s why. As a little background, our tracking of Volunteer activity has improved greatly over the past couple of years. There are still some areas for improvement and those will be addressed, but the data helps us understand how much of an impact You and the collective YOU can have in our organization and to benefit those we serve. Anyway back to the point, for our fiscal year 2017 (Oct 2016-Sep 2017) the theoretical cost benefit that volunteers provided our organization, and ultimately our students, was approximately $152,150. This is obtained from the product of the sum of volunteer hours times a theoretical $10/hour payment. (Colorado minimum wage is $9.30/hour). 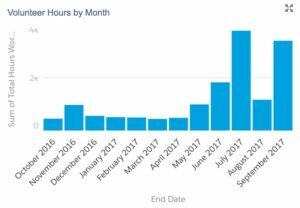 [FYI – the graph has a larger than normal spike in September due to many “catch up” hours being reported there. If spread across our two fee based membership ensembles (Blue Knights Drum and Bugle Corp and Blue Knights Percussion Ensemble) this is able to reduce those membership fees by about $760 per member. So if you’re a member, or parent of a member – please give a volunteer a hug or high-five for helping keep those fees down. 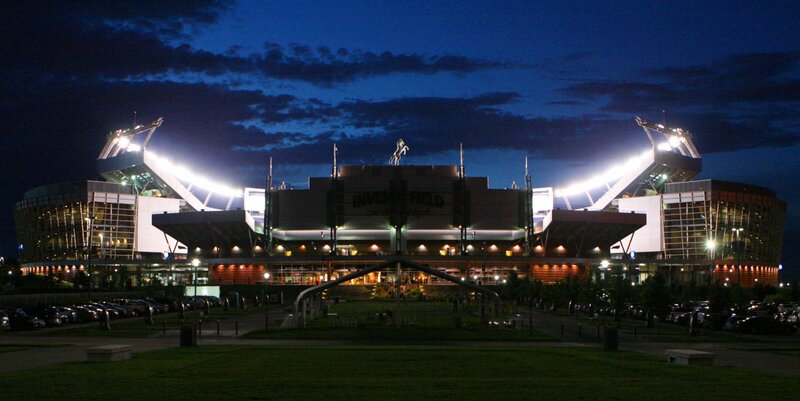 At a typical Denver drum corps camp we have approximately 35 volunteers and 350+ volunteer hours worked. There are roughly 90 slots for volunteers to sign up for at a camp in one of the 25+ shifts spread among 10 different jobs (i.e. the food service job has 7 shifts and each of those shifts has anywhere from 6 to 10 slots to fill). Bingo is also a very large effort and entirely volunteer run. For the fiscal year there were 54 volunteers that contributed 4,239 volunteer hours. Bingo shifts are each Wednesday and Friday with 4 hour sessions. This is a HUGE benefit to our organization’s operations and greatly benefits our Blue Knights Percussion Ensemble. There were 17 Blue Knights Drum Corps Touring Volunteers that accounted for 3,484 hours during June 18 and August 12, 2017. These were primarily via food service along with some van driving. 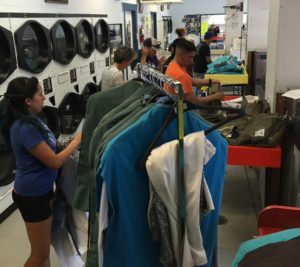 Another 25 people provided 187 hours of drop-in help and/or uniform washing during tour. We also were successful in building out a new 53’ food trailer for the drum corps using mostly volunteer effort. 783 hours of volunteer work by 29 individual over the course of 2-3 months. The result is a first class product that could set a new standard for drum corps mobile kitchens. We will finish this off with a few boring or exciting statistics (depending on your interest level). Then special “Shout-Outs” to a few people that went way over and above with their dedication to our organization with their gifts of time. And finally we’ll close with a list of each and every one our volunteers during fiscal year 2017 (or at least those that made it into our system). Thanks to each and every one!!!! Each of these people dedicated over 500 hours of time (some are close to 1,000 hours) to our organization. Thelma Fung – Thelma is our Director of Development in charge of all our donor activity and associated fundraisers. She does what she does because she loves what we do. Phyllis Ratterman and Joe Ratterman – The Rattermans run our bingo operations and support our Friendship Cup series and also DATR. 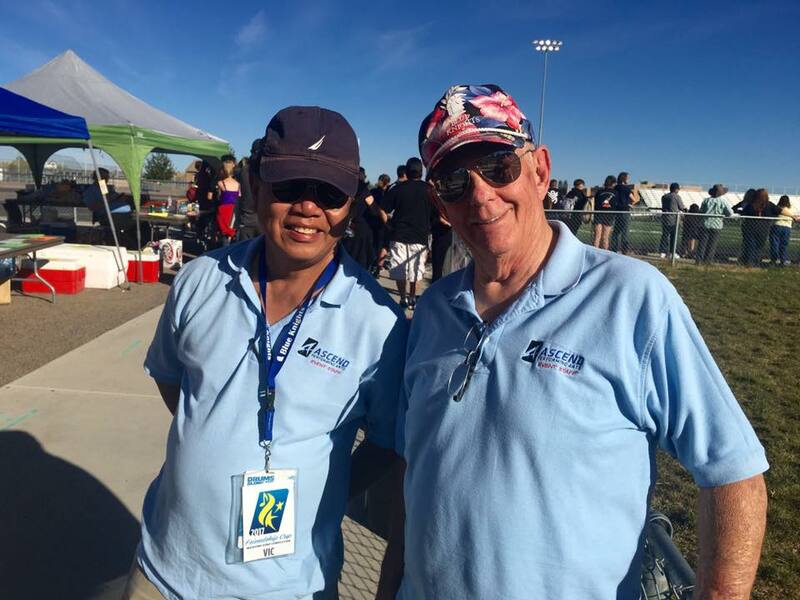 Over the years they have run the gamut of volunteer duties. If it needed done – they did it. 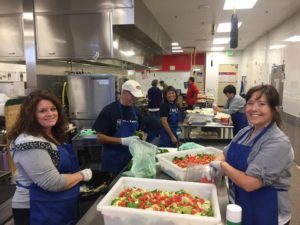 Janet Archibeque – Our wonderful Food Coordinator for Denver camps and also supports All-Days and parts of Tour with her time. If you don’t know Janet, you’re missing out. Alex Factor – The Alumni Coordinator, Alumni Corps Coordinator, a board member, and volunteer at other activities. He’s very determined to rebuild our Alumni communication. Keith Huffman – This is our Volunteer Coordinator and the guy that comes up with these numbers and names. Don’t let him fool you that he knows what he’s doing; though he does like what he’s doing. Diana Weeks – Diana was a wonderful Camp Volunteer and a Touring Volunteer with us last summer on the food trailer. It’s awesome to have a parent invest so much time with us. Below are all 251 people that volunteered during fiscal year 2017. Each name contributes to what we can accomplish. Thank you to the following! Please consider volunteering with us this year and make 2018 great!